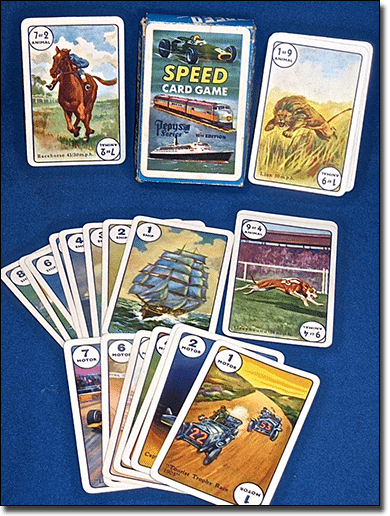 Speed is one of those great, classic card games that requires only a couple of players and a simple deck of cards to play, but can provide hours of entertainment and really bring out the competitor in us all. Speed is the kind of card game that you start out playing to kill a bit of time and before you know it you’re utterly hooked. It’s a great family game (especially for families with older children) and is often a favourite for pairs while travelling. As the name suggests, this is a fast moving game so players have to be on the ball at all times. The aim of Speed is to be the first player to get rid of all of your cards, so games usually have a lifespan of a mere couple of minutes. Speed is ideally played with two players, but can be played with more if extra decks of cards are used. For a two player game, a standard deck of 52 playing cards is required, excluding the jokers. Each player is dealt 20 cards, five of which they use to make up their hand, while the other 15 cards become their face-down draw pile. In-between the two players, two stacks of five cards are placed face down. These two stacks become the “replacement” piles. Once all this has been set up, two separate down facing cards are placed in the middle of the replacement piles. Gameplay is now officially ready to begin. The game starts with both players flipping over one of the down-facing cards. Players must then use the cards from their hand to simultaneously add to the pile, placing cards of either ascending or descending rank on top of the face-up card (for example, if the face-up card is a five, a four or a six can be placed). When it comes to face cards, the ranking is the standard Jack -> Queen -> King -> Ace, and a two card can be played on an Ace. Each hand can be topped up at any time from the pile of 15 face-down cards, however a player cannot have more than five cards in their hand at any one time. If neither player has a possible card they can play, a card from the replacement pile can be flipped on top of the active piles and play continues as per usual. If both replacement piles have been totally exhausted, the whole active pile can be flipped over, with the top two cards turned face-up and play resuming on top of these two new piles. The winner is the first player to get rid of not only their hand of five cards, but of all 15 cards in their pile. As explained in the gameplay above, there is no particular way to keep score in speed, as the winner is the first player to get rid of all their cards. However, given the very quick nature of the game, Speed is usually played in “tournament” style rounds, like the best of five games, or the first to win three games, etc. Players really have the freedom to get creative if they want to score in Speed, but keeping score is not imperative to the gameplay. Include the jokers – rather than excluding them, jokers can be included and used as ‘wild cards’. Using this format means that the joker can take place of any other card, so the smart move is for a player to hold onto any joker for when they’ve run out of other options. Inclusion of this rule generally stipulates that the joker cannot be the last card a player puts down. Calling ‘speed’ – this is a fun little addition to add a little spice to the game. Basically this variation requires the winning player to verbally declare “SPEED!” once they lay down their final card. If the player fails to do so, they must pick up one of the central stacks of card and use this as their new draw pile, resuming play as usual. Child friendly version – the standard game of Speed can sometimes be a bit difficult for younger children to grasp, but you can make it easier with a few slight variations to the rules. To make it more child friendly, simply allow cards of the same rank to be played on top of each other (therefore if a seven is the face-up card, you can play another seven on it in addition to the usual six or eight). The game can also be altered so that the standard hand is extended to six or seven cards to make it easier for young ones to find a match. Can you play Speed online? Speed is a popular game and can be found at several free play card game websites, however you won’t find it any real money casino sites. Given its sheer simplicity and minimal equipment requirements, Speed is best played in real life with a deck of cards and a mate as it’s the competitive element of wanting to beat your friend to the punch that is the real fun. Want to play similar card game online for real money or fun? Try Royal Vegas Casino‘s numerous high-quality card games on your computer or mobile device.